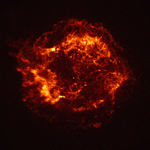 Chandra :: Photo Album :: Cassiopeia A :: What Do These Images Tell Us? These images show Cas A as viewed by four different types of telescopes. 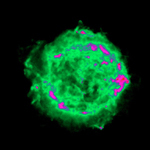 The X-ray image of the Cassiopeia A supernova remnant on the left is the official first light image of the Chandra X-ray Observatory. The 5,000 second image was made with the Advanced CCD Imaging Spectrometer (ACIS). Two shock waves are visible: a fast outer shock and a slower inner shock. The inner shock wave is believed to be due to the collision of the ejecta from the supernova explosion with a circumstellar shell of material, heating it to a temperature of ten million degrees. The outer shock wave is analogous to an awesome sonic boom resulting from this collision. The bright object near the center may be the long sought neutron star or black hole that remained after the explosion that produced Cas A. The optical image of Cas A shows matter with a temperature of about ten thousand degrees. Some of these wisps contain high concentrations of heavy elements and are thought to be dense clumps of ejected stellar material. 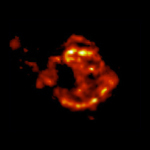 The infrared image of Cas A shows dust grains that have been swept up and heated to several hundred degrees by the expanding hot gas. It is not known whether the dust grains were ejected by the star millions of years before it exploded or during the explosion. Cas A gets its name from radio astronomers, who ‘rediscovered' it in 1948 as the strongest radio source in the constellation of Cassiopeia. About 5 years later optical astronomers found the faint wisps, and it was determined that Cas A is the remnant of an explosion that occurred about 300 years ago. The radio emission comes from high-energy electrons moving in large spirals around magnetic field lines of force.